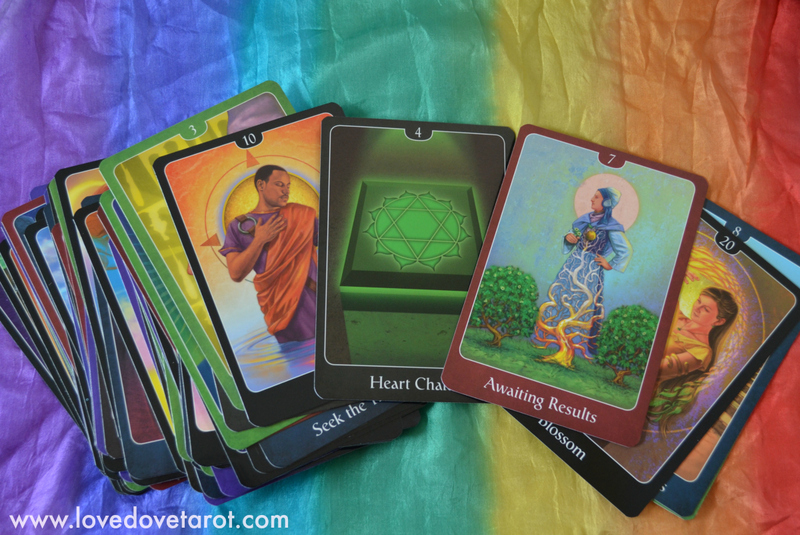 A while back, I created a Heart Chakra spread with the Psychic Tarot Oracle, to be used with the Romance Angels Oracle or an oracle of your choice. Now that John Holland has come out with a more relationship specific deck, I thought it would be fun to revisit this spread, using his Psychic Tarot for the Heart Oracle. This time, I decided to pull the Oracle advice card from the Wild Wisdom of the Faery Oracle deck. The Heart Chakra is the centre in your energy body where you connect with your Beloved at the level of the soul. If there is any kind of imbalance or withholding, the energy of love can’t flow freely between you. This spread can be used to detect the disruption and also provide a remedy. 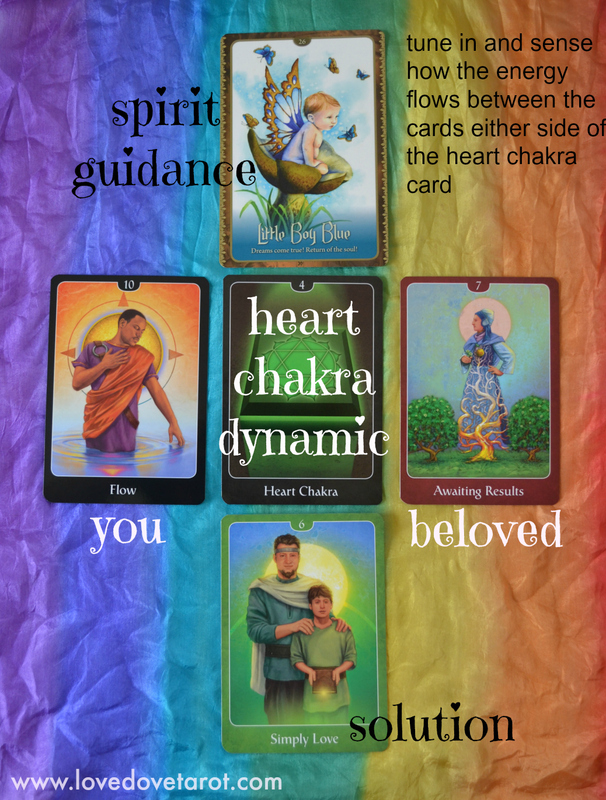 First you shuffle the cards as usual and locate the heart chakra card in the Psychic Tarot for the Heart Oracle. The card immediately to the left represents your energy and the card to the right gives you a visual representation of how the energy of your Beloved currently flows at the heart chakra level. Take a minute to tune in to the energy of both and try to sense if there is harmony, a push-pull dynamic or an outright clash here. In the sample below we can see that the energy of person one is much more expansive (Flow/Wheel of Fortune) than that of person two (Awaiting Results/7 of Pentacles). Then lay the cards out in a row and reshuffle the deck. Pull one card from the top (or wherever you feel guided to pull it from) and place it under the row of three. Finally, shuffle your oracle deck, cut and pull one card to go at the top of the spread. The card at the bottom provides the solution to the push-pull dynamic above and also indicates that there are no serious issues even though there is a slight imbalance. The card at the top is further advice from the realm of the Fae or whichever oracular realm you have chosen to work with. In this particular case, Little Boy Blue is advice from the Faeries that there is great hope for this relationship to manifest into something beautiful and that all that is needed is to stay optimistic about the future.